Thousands of years ago, a small civilization of hunter gatherers migrated to the coastal regions of Southeast Asia. These people progressed into a widespread tribe of travelling sea dwellers. To this day, some of them have remained a stateless people without a consistent infrastructure, sometimes living miles away from land. Yet these people are one of the few civilizations whose collective life practices have survived so long through human history. They are called the Badjao. Badjao means man of the sea, but this tribal group is better known by their nickname Sea Gypsies or the Godforsaken Ones, because they move with the wind and the tide on their small houseboats called vintas, currently inhabiting the waters and shores of the Sulu archipelago – a chain of islands in the Pacific Ocean belonging to what are now the Philippines- and various waters surrounding the Indonesian Island Sulawesi. The waters where these people dwell are regarded one the most dangerous in the world, with sporadic policing and a very high incidence of open piracy. Yet, defying all odds, the Bajao are regarded a very peace-loving tribe, preferring to flee from danger instead of picking up weapons. This approach is very unique amongst the common ethos of the ethnicgroup they belong to and very different from the approach of neighbouring tribes. As opposed to their land-based Sama relatives, they only come to shore to bury their deceased, to fix their boats or when they are in potential danger. Despite the romantic portrayals of the tribe, the Badjao never really had an easy live. Other tribes are said to look down on these fisher folk and call them palao or lumaan (God forsaken), this is partly due to their uncommon native religion, which is a combination of converted Islam and animism, worshipping both a God and the spirits and deceased ancestors that live in the currents and tides, in the corals and the mangroves. These spirits are still part of their families and humble homes and de Badjao will do anything in their power to keep them happy. Some of the traditional pre-Islamic beliefs are offerings made to the God of the Sea, the Omboh Dilaut, whenever a large catch of fish is brought in and by setting a ‘spirit boat’ adrift in the open sea. Fishing isn’t only a part of the Badjao’s spiritual practice, it is also a means for them to survive and maintain their nomadic lifestyle out on the Open Sea. Often travelling by boat from one island to the other in search of fishing harvest, they fish with nets and lines and are expert free divers, going to improbable depths in search of pearls and sea cucumbers or to hunt with handmade spear guns. However, the uprise of destructive fishing techniques among other coastal populations in South East Asia, have made it almost impossible for the Badjao to maintainan their traditions. Home made fertiliser bombs, cyanide and dynamite fishing are now common practice; practices that are being driven predominantly by an industry whose global worth is estimated at 1 billion US dollars. The trade’s epicentre is based out of Hong Kong, while Indonesia and Malaysia supply most of the fish, accounting for nearly 50% of all imports. Target species are reef species that are key to the preservation of coral ecosystems and the Badjao’s way of living. Threatened by overfishing, attacks from rivaling tribes and soaring costs for fuel and repairs for their boats, more and more Badjao are settling permanently on land. However, the ones that still remain, have proven highly resourceful, building thatch-roofed houses on poles in the water out of driftwood and bamboo. When a storm hits a home or community, neighboring Badjao will spare as much material of their own as possible, to help fortify damaged homes. 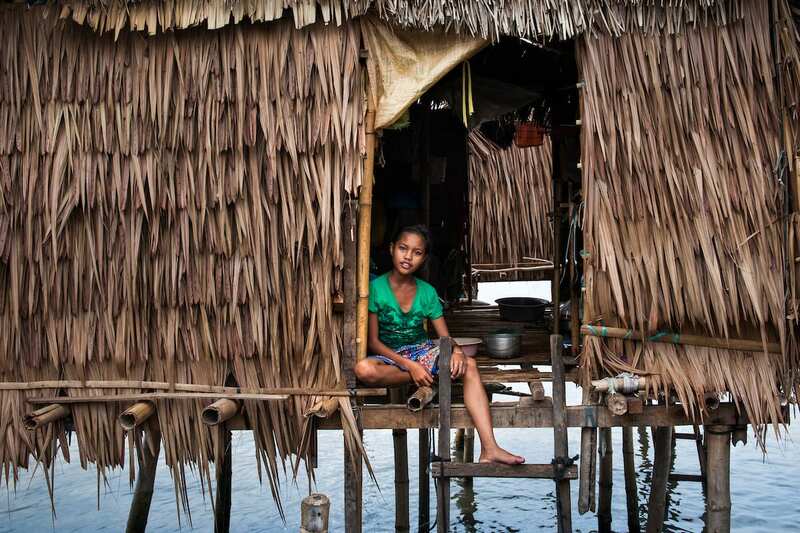 Their homes are built on stilts that are carefully placed in between coastal rocks and coral. This activity is a communal effort, so as to ensure no wildlife is harmed as they set foundations. With small, family owned boats they continue to roam the waters, fighting the current to follow schools of fish, hunting for the bounty of the ocean, trying to make a living and find refuge in the vastness of the deep blue sea. These guardians of the sea have experienced themselves that times are tough on the water, but worse on land. At present the Badjao are the most marginalized ethnic group and one of the poorest tribes in the Philippines, a Muslim tribe that is shunned. Their vibrant nomadic lifestyle, the way of life bequeathed to them by their ancestors has vanished in most parts of Mindanao. For centuries the Badjao have been a resilient tribal group, they firmly pushed away modernity with both hands, but tossed by modern winds they will have to find ways to maintain their unique lifestyle and culture, otherwise they might truly become Godforsaken. Please share this article to create awareness about what is going on with our Earths’ waters and the people that protect them by maintaining their traditional ways of life. Thank you.